Looking like a giant bird's nest hovering between trees, Cocoon Tree is a lightweight, waterproof and inexpensive treehouse pod. You can assemble and mount it yourself in two hours, or have it done by a team of experienced climbers, working under the guidance of the Cocoon Tree’s founder and creative director Berni Du Payrat. What makes it even more appealing to nature lovers is the fact that its air-conditioning mechanisms can be powered sustainably using sun and wind power. Cocoon Tree is a spherical aluminium structure that weighs only 130 pounds. Rigged up with ropes and secured by nets, the structure has 12 locking points for both the suspension and for lateral stability. It can hold the weight of up to a ton. A large mattress (3 meters in diameter) and a custom made duvet can be placed inside it, accommodating 2 people, or even a couple with 2 small children. The cozy interior is sheltered from the elements by a robust waterproof outer skin, while deploying fan air-conditioning and ventilation in extreme weather conditions. To make it completely tight, the designers have added mosquito screens for the openings. 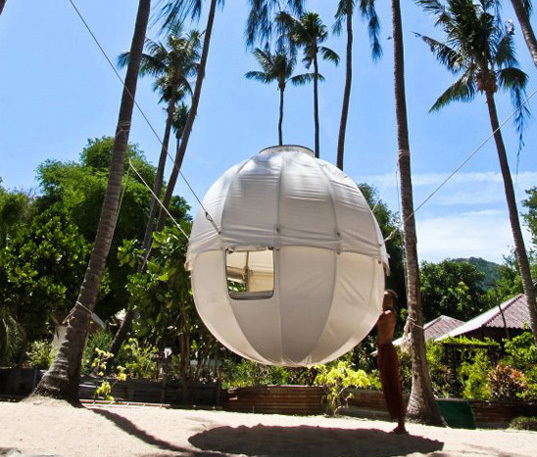 There are different models of the Cocoon, designed according to various uses: Cocoon Tree is a treehouse, Cocoon Beach is a model for beachgoers and Cocoon Jungle, coated with synthetic fiber that imitates bamboo, offers full protection from the elements. All these can be placed on the ground with adaptable feet, fixed on a post driven into the bottom of a lake, attached to a floating ring, suspended in a tree or floating on a platform. Lovely idea!!! I wanna see what is it like INSIDE too!! 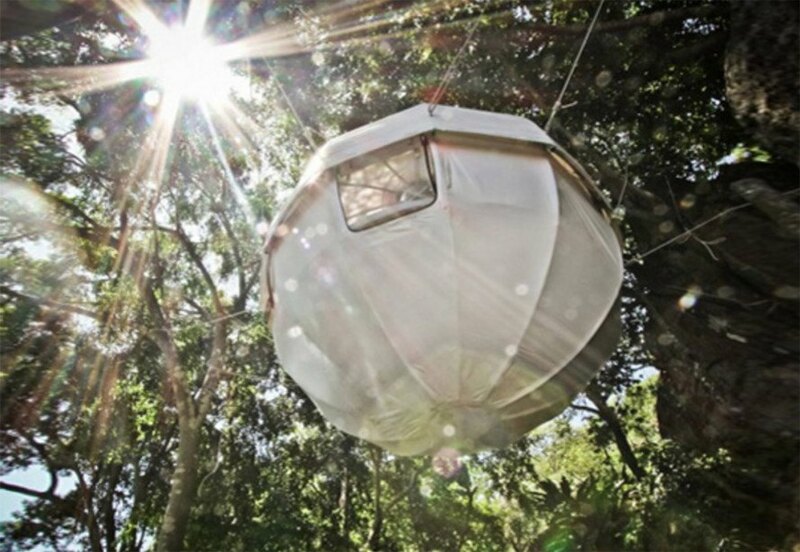 Cocoon Tree houses are spherical aluminium structures that weigh only 130 pounds. The cozy interior is sheltered from the elements by a robust water-proof outer skin. It can hold the weight of up to a ton. The Cocoon Tree, rigged up with ropes and secured by nets, has 12 locking points for both the suspension and for lateral stability. You can have it assembled and mounted by a team of experienced climbers. There are different models of the Cocoon, designed according to various uses.